A timeline of the the major religious holidays in the UK. Sikh devotees bathing at the Golden Temple on the occasion of Vaisakhi. 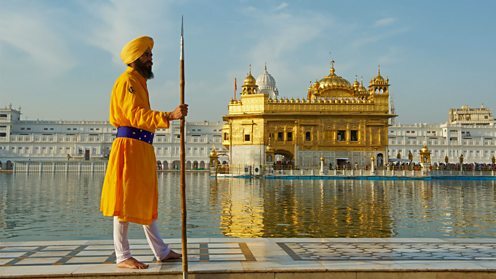 At Vaisakhi, Sikhs celebrate the founding of the Khalsa, the collective body of baptised Sikhs created in 1699. The word Khalsa means 'pure'. To join the Khalsa, Sikhs must undergo the Amrit ceremony (initiation ceremony) sanctioned by Guru Gobind Singh. Baptised Sikhs resolve not to remove or cut any bodily hair, not to use tobacco, alcohol or other intoxicants, not to eat meat and not to commit adultery. At Vaisakhi, those ready to join the Khalsa are baptised. 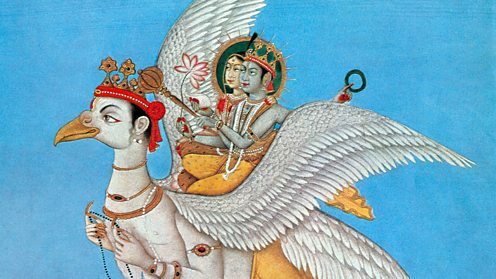 Indian miniature c.AD1780 showing a scene from the Ramayana: Rama and his wife Sita riding on Garuda, the sun-eagle. At Rama Navami Hindus celebrate the birth of Lord Rama. It falls on the ninth day of Chaitra in the Hindu calendar (March/April). Rama Navami is one of the most important Hindu festivals. Lord Rama is an incarnation of the god Vishnu and the hero of the epic Ramayana, which is recited in its entirety in the week leading up to Rama Navama, and on the day itself. A hand carved white marble statue of Mahavira in a Jain temple inside Jaisalmer Fort, Rajasthan. Mahavir Jayanti is the most important religious holiday for Jains. It’s celebrated in the Hindu month of Caitra (late March/early April). 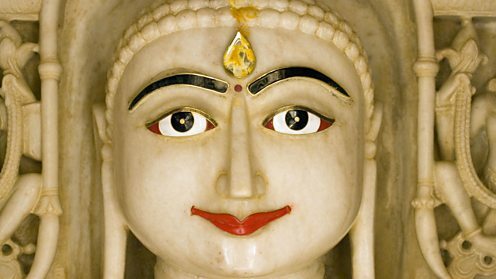 Mahavir Jayanti celebrates the birth of Mahavira, a contemporary of the Buddha. Mahavira was last Tirthankara (great sage) and the most important prophet of the Jain faith. Mahavir Jayanti is marked with prayer and fasting. 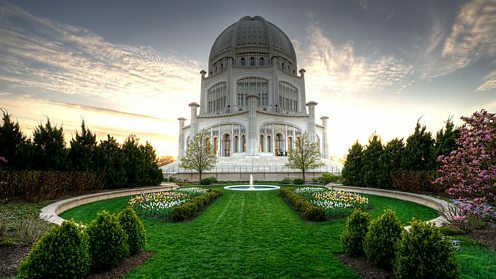 The Bahá'í House of Worship in Wilmette, Illinois is one of only seven Houses of Worship worldwide and the only one in the USA. During the Festival of Ridván, Bahá'ís remember the 12 days that their founder, Bahá'u'lláh, spent in the Garden of Ridván. During this period in 1863, Bahá’u’lláh publicly declared his mission as God’s messenger for his age. The first (April 21), ninth (April 29) and 12th (May 2) days are celebrated as holy days when work is suspended. 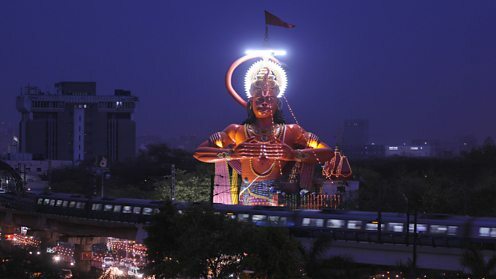 An illuminated statue of Lord Hanuman on the eve of Hanuman Jayanti at Karol Bagh temple, New Delhi. At Hanuman Jayanti, Hindus celebrate the birth of the god Hanuman. It falls in the month of Chaitra in the Hindu calendar (April). Hanuman is an ardent devotee of Lord Rama, and is revered for his dedication to him. As he’s believed to have been born at sunrise, celebrations in his honour begin early in the morning. Devotees visit the temple and apply sindoor (red powder) to their foreheads, as Hanuman’s image is always coloured red. Hanuman is the symbol of strength and energy and he can assume any form, a power which he uses to conquer evil. Passover starts with a special dinner called 'seder'. The foods eaten at seder have a symbolic meaning related to the escape from slavery. At Passover, Jews remember the Israelites' liberation from slavery in Egypt. It's one of the most important festivals of the year. 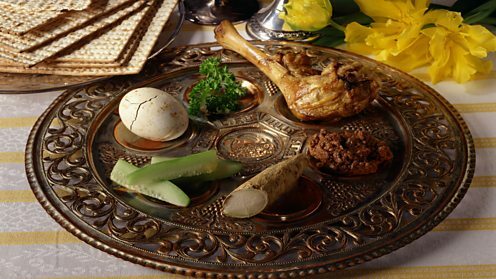 Passover lasts for eight days. Jewish people celebrate with special ceremonies, and observe specific customs which remember the escape from Egypt, as told in the Book of Exodus. Russian Orthodox Easter ceremony at Vladimirsky Cathedral, St Petersburg. 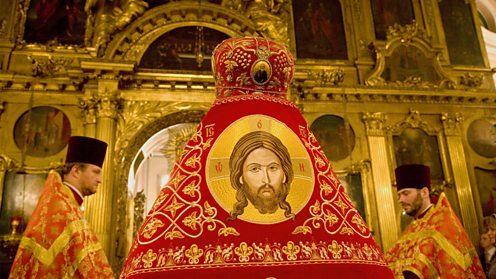 Easter is the most sacred time of year for the Orthodox Church, beginning with Great Lent seven weeks before Easter Day. In some years Easter Day falls on the same day for Eastern and Western churches, but in most years Orthodox Easter falls later. 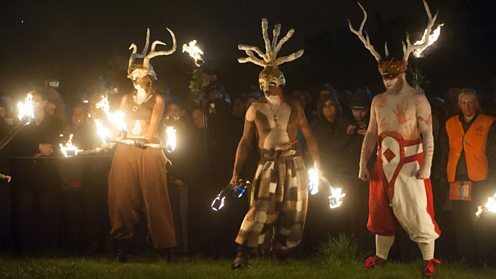 Since the 1980s the Beltane Fire Society has recreated the ancient Celtic Pagan Beltane Fire Festival on Calton Hill in Edinburgh. 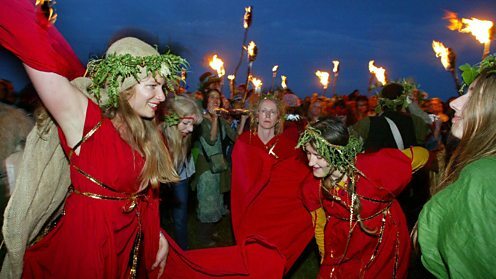 For Pagans, Beltane is a fire festival which celebrates the arrival of summer and the fertility of the coming year. Beltane means 'fires of Bel' – after the Celtic deity Belenus. Fires were lit to celebrate the return of life and the burning away of winter. These fires were thought to cleanse, purify and increase fertility. Cattle and even people were often passed between two fires to ensure good fortune and fertility. Beltane was also associated with courting rituals, for example maypole dancing, which symbolises the union of the god and the goddess. 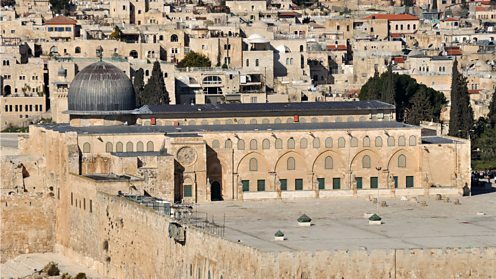 Al-Aqsa mosque in Jerusalem which marks the site where the Prophet Muhammad is said to have been transported during his night journey. Lailat al Miraj is when Muslims commemorate the Prophet Muhammad's nighttime journey from Mecca to the 'Farthest Mosque' in Jerusalem. 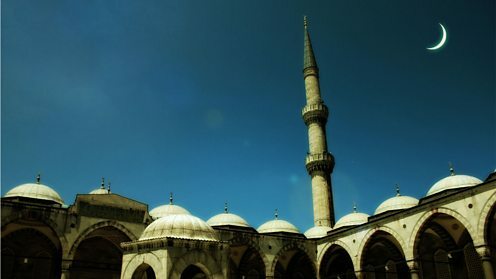 Muslims believe that during this journey the Prophet Muhammad ascended to heaven, was purified, and instructed by God that Muslims should pray five times daily. These events are described briefly in the Quran. Muslims celebrate by retelling the story to their children and reciting special nighttime prayers. 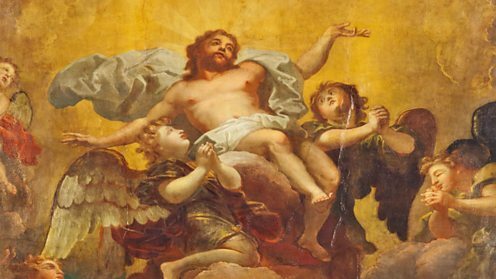 The Ascension (AD1695) by Pierre Berchet from the ceiling painting in the chapel of Trinity College, Oxford. Ascension celebrates the day when Jesus Christ is said to have ascended bodily into heaven, in the presence of the apostles. The Ascension is believed to have occurred on the 40th day after Easter, and consequently falls on a Thursday. In recent times the Catholic Church has celebrated the Feast of the Ascension on the Sunday after Ascension Thursday. Buddha Statue in Kuala Lumpur, Malaysia at Vesak. 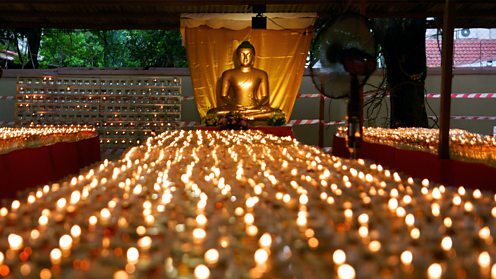 Vesak or Buddha Day is the major festival of the year for Buddhists from the Theravada tradition. Vesak celebrates the birth, enlightenment and death of the Buddha. It's called Vesak after the month in which it falls in the Indian calendar. 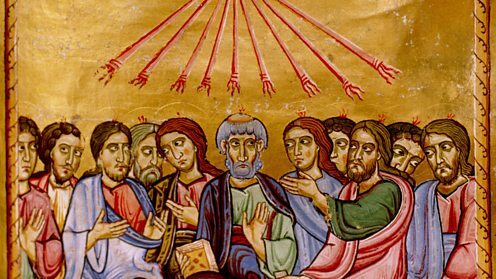 A 12th century artist’s impression of Pentecost from St Peter’s Abbey, Salzburg, showing tongues of fire to symbolise the Holy Spirit. At Pentecost Christians celebrate the day when the Holy Spirit is said to have descended on Jesus's Apostles. The Holy Spirit is the third part of the Trinity of Father, Son, and Holy Spirit which is how Christians understand God. Pentecost is regarded as the birthday of the Christian Church, and the start of the Church's mission to the world. Lailat al Bara'a - the Night of Forgiveness - takes place two weeks before the beginning of Ramadan. 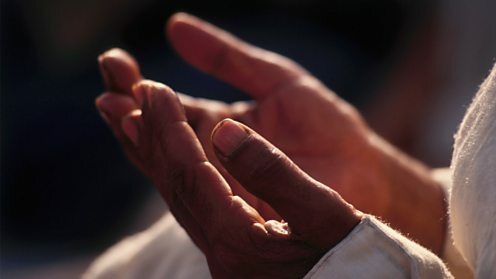 On this night, Muslims pray and ask God for forgiveness for their sins either at the mosque or at home. They believe that on this night one’s destiny is fixed for the year ahead. Visiting the graves of relatives and giving to charity is traditional at this time. How important is forgiveness in the world religions? Those who are patient in adversity and forgive wrongs are the doers of excellence. 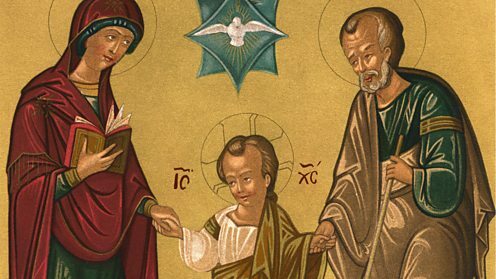 17th century Greek impression of The Trinity: the unseen God the Father, Jesus the son with his earthly parents, and the Holy Spirit as a dove. Trinity Sunday is the Sunday after Pentecost when Christians celebrate the belief in three aspects of the one God – Father, Son and Holy Spirit. Trinity Sunday was instituted by Pope Gregory IX in AD828 and is known for being the only major Christian festival that celebrates a Church doctrine rather than an event in its history. 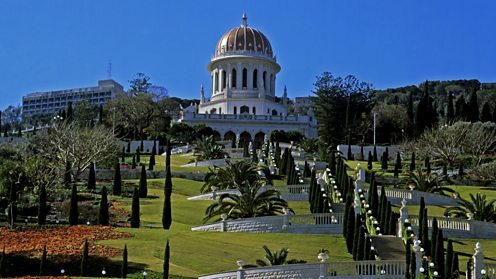 On this day Bahá'ís remember the day in 1844, when the Báb foretold the coming of a new messenger from God. After the death of the Báb, his follower Bahá’u’lláh proclaimed himself to be this messenger and founded the Bahá’í faith. The Declaration of the Báb is one of the nine holy days in the Bahá'í calendar when work is suspended. Corpus Christi is celebrated by Christians on the Thursday after Trinity Sunday. ‘Corpus Christi’ is a Latin phrase that means ‘body of Christ’. 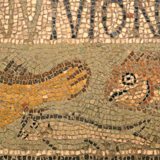 At Corpus Christi, Christians celebrate the Eucharist (Holy Communion) when they take consecrated bread and wine which stand for the body and blood of Christ. 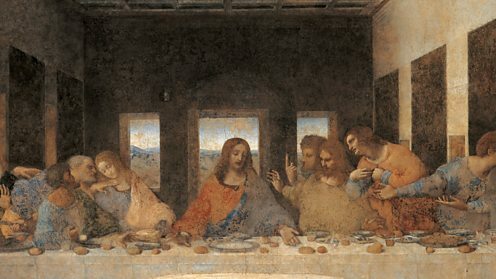 The Eucharist commemorates the Last Supper as described in the Bible, which according to Christian tradition took place on the day before Jesus’s crucifixion. Corpus Christi is primarily celebrated by Roman Catholics. Ramadan begins with the sighting of the new moon that marks the start of the ninth month in the Islamic calendar. Ramadan is the ninth month in the Islamic calendar and is a time of fasting and spiritual renewal. According to the Koran, the Prophet Muhammad received the first revelations of the Koran during Ramadan. Therefore Ramadan is considered the most sacred month of the Islamic calendar. Fasting during Ramadan was instituted early in Islamic history when the first Muslim community migrated from Mecca to Medina. Every day from sunrise to sunset, Muslims are required to refrain from consuming food and liquids, smoking, and engaging in sexual relations. 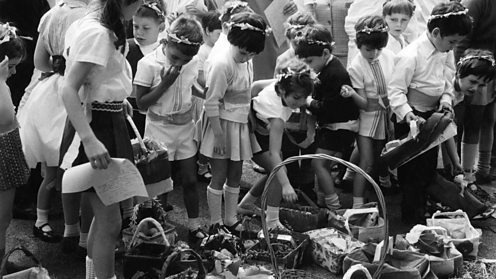 A Shavuot pageant, Gathering the Fruits, at Matilda Marks Kennedy School, London, 30 May 1968. Shavuot or the Festival of Weeks is a harvest festival when Jews give thanks for the first fruits of the year. Shavuot also marks the time when Moses received the Torah on Mount Sinai. It's a time to give thanks for the Holy Book and to study its texts. The Golden Temple (Harmindir Sahib) at Amritsar - the spiritual and cultural centre of the Sikh religion. Guru Arjan Dev was the fifth of the ten Sikh Gurus and the first Sikh martyr. 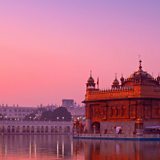 He laid the foundations of the Golden Temple (Harmandir Sahib) in Amritsar, India and gave it four doors to symbolise acceptance of all people. He compiled the previous Gurus' writings into one book which formed the basis of the Guru Granth Sahib (Sikh Holy Book). In 1606 he was tortured and sentenced to death by the Muslim Emperor Jahangir. My faith is for the people of all castes and all creeds from whichever direction they come and to whichever direction they bow. Revellers celebrating Summer Solstice at Stonehenge, Wiltshire. At Summer Solstice Pagans celebrate Midsummer or Litha, which means 'standing still of the sun'. It’s the longest day of the year. Pagans are in awe of the sun and its creative power. For some Pagans the Summer Solstice marked the marriage of the God and Goddess whose union creates the harvest's fruits. It’s a time to celebrate growth and life, but also to acknowledge the Wheel of Life and that the sun will now begin to decline once more towards winter. In England many Pagans and non-Pagans visit ancient religious sites like Stonehenge and Avebury to see the sunrise at Summer Solstice. 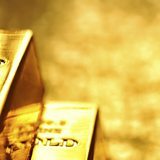 Can banking ever be ethical?